The Friends of Valkenberg Trust works in conjunction with hospital staff at Valkenberg Psychiatric Hospital to promote the recovery of people with serious mental illnesses. This is vital, as it means people can get back to their lives, their families, their jobs and their communities! 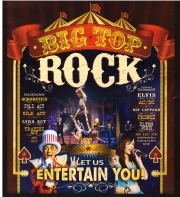 Make a difference to someone's recovery by enjoying the latest show at the Barnyard - Big Top Rock! Your participation will mean wellness and a return to the community for many people each year. A fabulous night out on Saturday 8 June @ 8pm, featuring live circus acts together with the music of Elton John, ACDC, Prince etc.